After leaving Multnomah Falls, I tootled eastward along I-84, minding my own business for about four hours, until I came upon a sight that made me realize I was coming in to the north country. Never mind that I was, by then, heading southeast. Traveling west to east along the Columbia River doesn't make me think "north" - though coming to the river from the south might indeed make me think that. 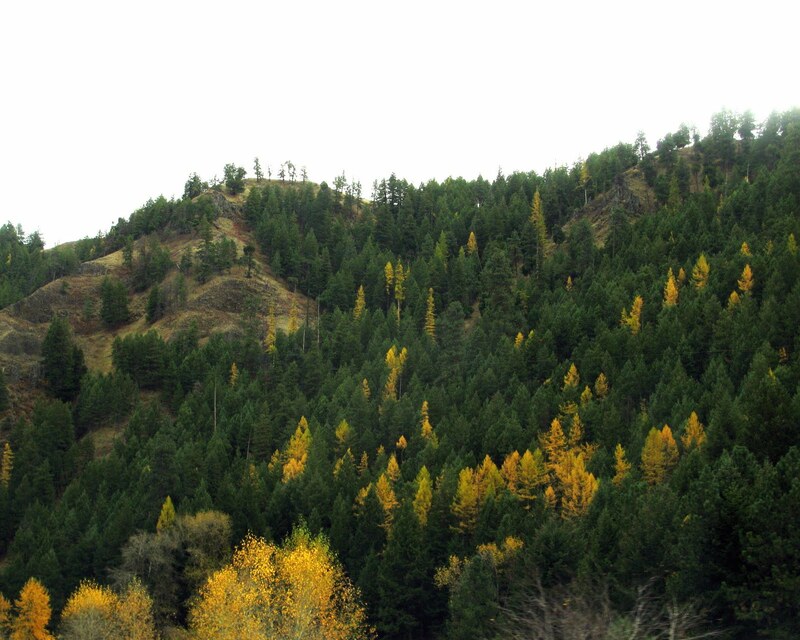 The yellow-green to yellow-orange trees I saw on the hillside made me think north, and they always do. 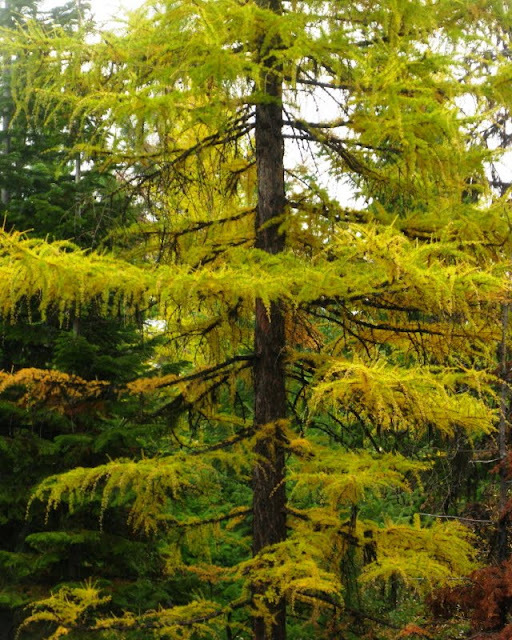 These trees are conifers, commonly known as western larch (Larix occidentalis), sometimes called deciduous because they lose their needles every year. They are like little flames on the hillsides in the fall, when their needles turn yellow-green, then yellow, and then orange. I was treated to great hospitality by Liz and her partner Jerry. The hospitality included a salad from homegrown vegetables and a great local beer: Terminal Gravity IPA brewed by the Terminal Gravity Brewery in Enterprise, Oregon . After enjoying bloggish conversation, I was escorted to the guest teepee. 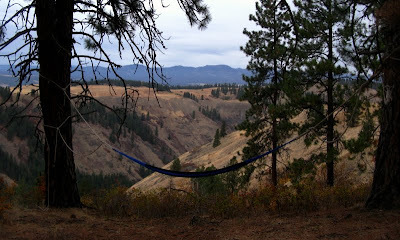 In the morning, I awoke to this great view of the canyonlands of northeastern Oregon. 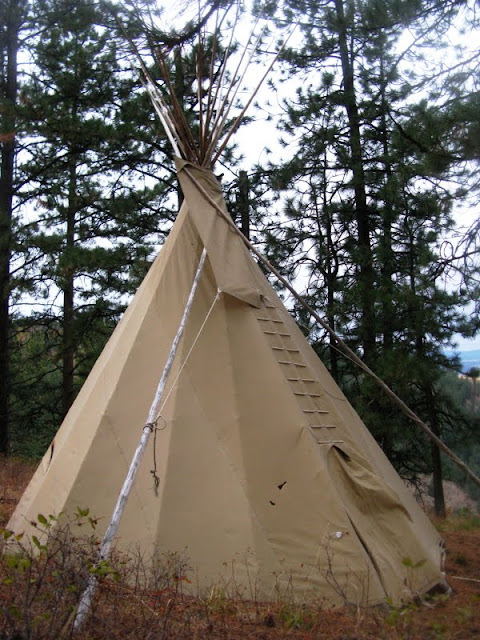 This is the teepee that was my overnight home. 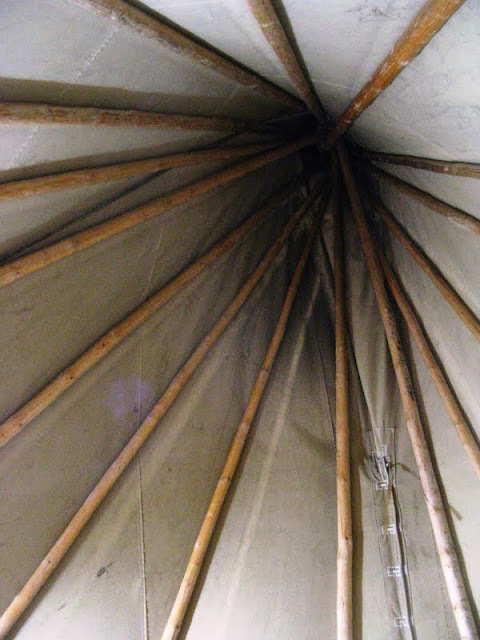 I was told by my hosts, after morning coffee, that the holes in the teepee canvas were put there by the slashing claws of a black bear. I didn't hear anything terribly suspicious in the dark of the night, but did hear coyotes in the early morning. The yurt, as seen from the teepee. 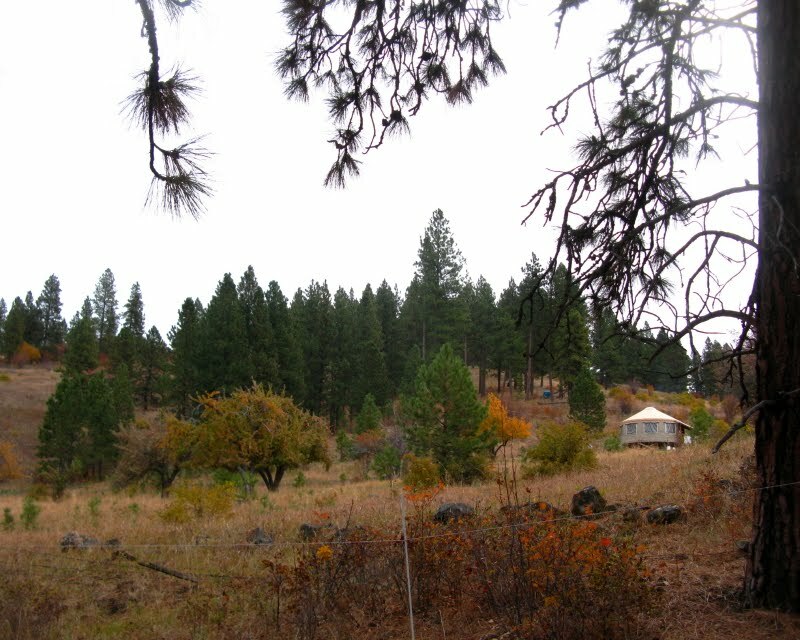 More about yurt living at Yips and Howls. The countryside is underlain by basalt flows, like these barely seen under cloudy skies. 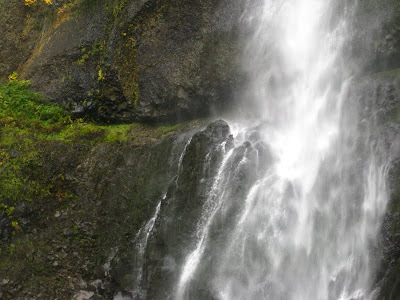 These flows are part of the same Grand Ronde Basalt (CRBG) that we saw at Multnomah Falls. 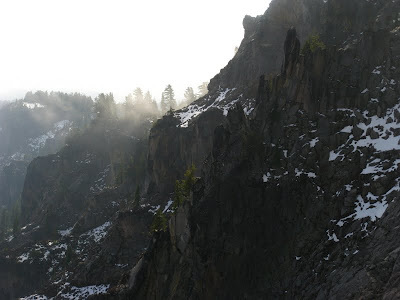 Flows of the Grand Ronde Basalt are well exposed in Joseph Canyon at the Joseph Canyon Viewpoint on Highway 3. The basalt flows erupted from long fissure vents in this part of northeast Oregon and in southeast Washington; the resulting dike system is sometimes known as the Chief Joseph Dike Swarm. I took a few pictures in the pouring rain, did not see any dikes, and moved on. Yes, the larch were turning yellow! 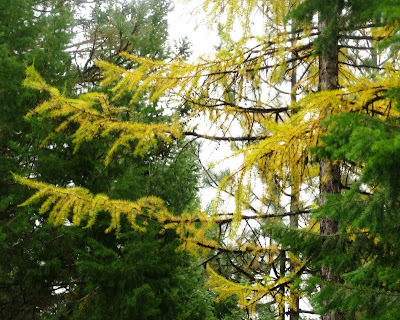 I first saw larch in west-central Idaho, probably not much farther north than these trees are located. It was spring, and the new feathery needles were on the trees. 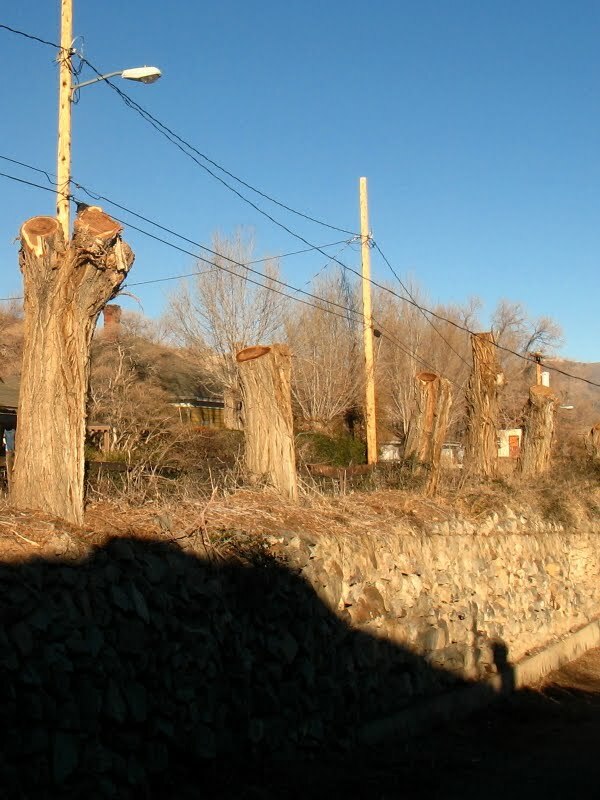 I was amazed to "discover" such an unusual tree, and I'm still amazed every time I see them. 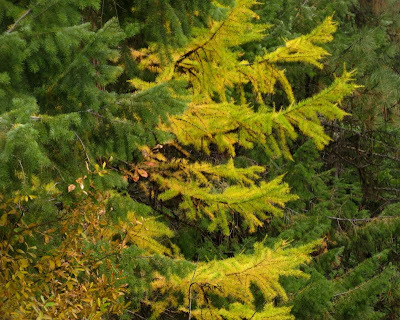 Larches remind me of that first trip north of Boise a long time ago, and they remind me of every trip I've taken on the Alcan since then. Liz Enslin has more about larch, as part of her Species of the Week series. 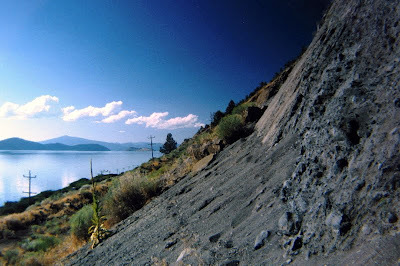 General Overview of the Columbia River Basalt Province (with photo of a dike in the Chief Joseph dike swarm). 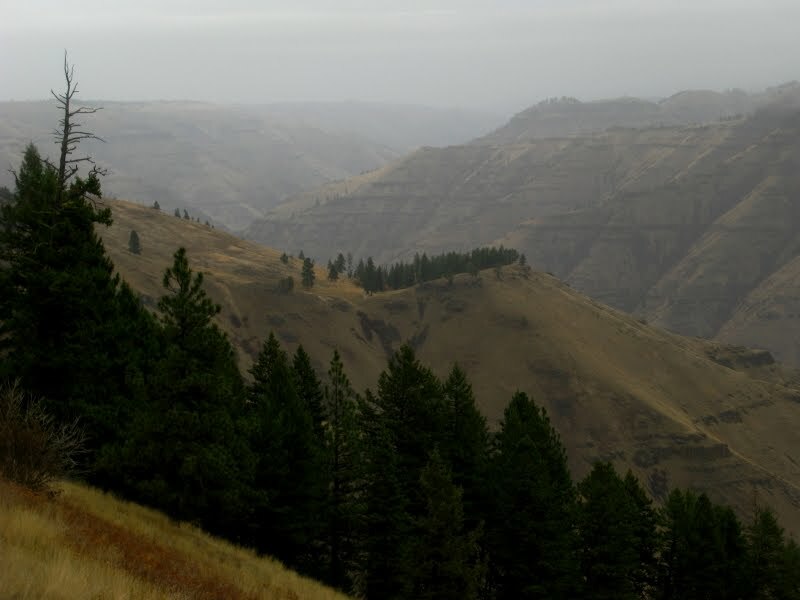 Photo Tour of the Columbia River Basalt Province (with photos of the Grand Ronde Basalt and some cross-cutting dikes). One, I used a whip and a plastic spatula (scraper) for stirring rather than an elecric mixer. An electric mixer is generally not recommended for banana breads, and extra beating is not recommended for high altitude cooking (which I was doing, although I didn't pay any attention to that fact before I started). Two, I puréed the walnuts in a coffee grinder (we don't have a cuisinart or blender at our little house because of space considerations, but may shortly get a small blender). The addition of puréed walnuts rather than chopped walnuts was a little like adding 1/2 cups extra flour with a minor or trace amount of extra oil. Three, I didn't use any raisins. I added two or three large dollops of applesause. I added one or two smaller dollops of sour cream. I then added a minor scattering of extra flour after wondering if the mixture was too moist. I added a little extra cinnamon for more flavor. I increased the cooking temperature by 25°F, and possibly could have decreased the cooking time but didn't. It would be normal to reduce the baking powder as part of the high-altitude cooking adjustment, but I didn't consider adjustments early enough to do that. The resulting loaf seemed too dry to me when it first came out of the oven, but after placing in a plastic baggie overnight it didn't seem that way at all. 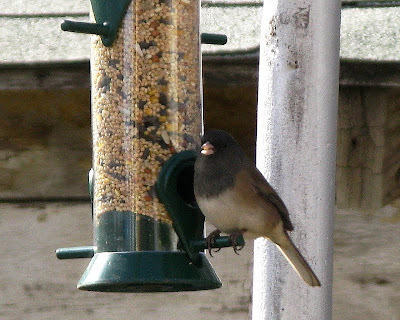 Next time I will probably look for a recipe that uses applesauce to begin with, and modify it for wheat-free flour. I'm wondering if some combination of applesauce and sour cream could be substituted for a half or more of the oil. Sorry, no pictures - it's already gone! 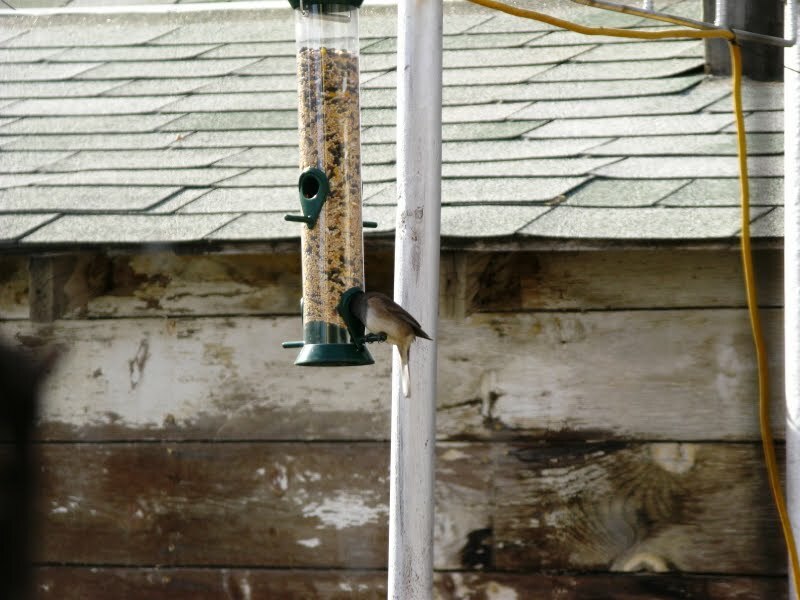 While we are waiting for the bird in the oven to cook, we have been watching smaller birds discover our new birdfeeder, which hangs from a bungee cord over our wintertime garden. Here, I'm looking out our entryway window, spying on one of the first Juncos to find the feeder. 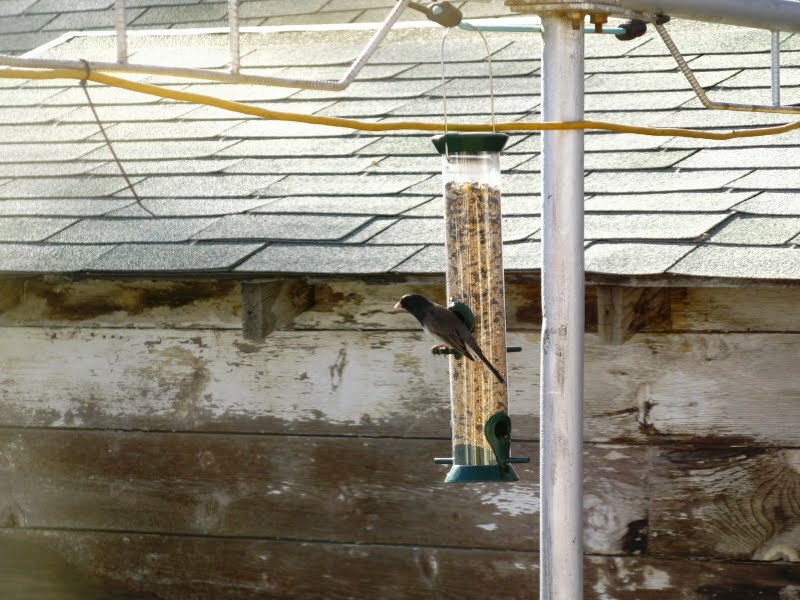 These birds act quite nervous about this new feeder - seems they are used to hiding in elm trees, and maybe aren't used to being so close to the ground while eating. 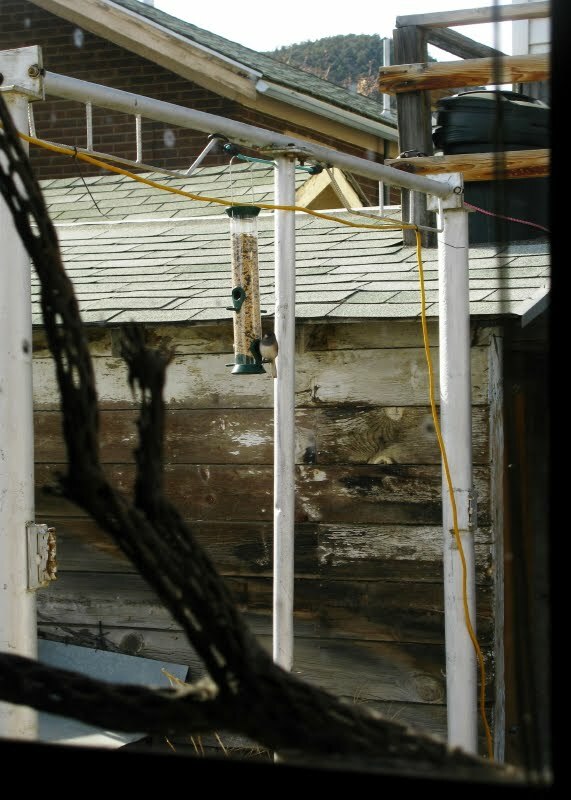 Or maybe they just don't like being watched, or are aware of the many outdoor house cats that prowl the area. ...and comes out with a millet seed. Just a quick update about the current state of comment moderation on LFD. I've been receiving more than the usual number of spam comments linking to advertising sites and such, so I have put all posts on comment moderation, not just the usual pre-14-day posts. I'll leave it this way until spammites (not psammites, one of my favorite rock types) taper off. I'm thinking that maybe spammers/bots have ramped up their activity for the holidays. The Fine Print: Names that link to adverstisements and websites selling things, instead of the more usual profile or blog, are automatically considered spam and will not be published or, if accidentally published, will be deleted mercilessly. Comments that contain links to advertisements and websites selling things are also considered spam, even if the comment seems "friendly." Sign-in names like "Mr. Low Prices" are dead giveaways that you happen to be a spammer. I will not publish any comments under any circumstances that link to sites selling research papers. If you think I should mention your website, blog, or name on this website - AND YOU HAVEN'T EVEN BOTHERED TO LINK TO MINE - uh, WTF?? UPDATE: Comments are back to the usual, with moderation only on posts older than 15 days. This state of affairs is subject to change without warning when I'm traveling or when I have poor or intermittent internet connections. I'm a little late posting this one - three days to be precise - but am going ahead with it, and using the original publish date. My excuse? I was out of town without access to wifi. 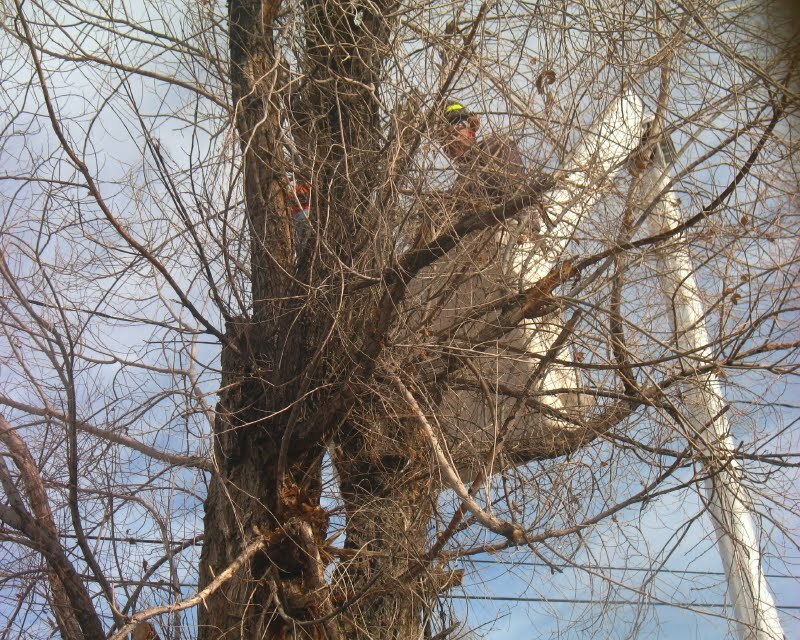 It was exactly one year ago when these nefarious people came along and cut down the elm trees growing near our little house in the hinterland of eastern Nevada. I was annoyed and saddened by this at the time, and blogged briefly about it last spring, when I showed what the now barren wall looked like in the before state. It still looks barren out there to me. When I left the GSA meeting in Portland, I decided to take a different route back, one that would normally be shorter, except for several sidetrips that I took. After figuring out how to get away from downtown Portland despite faulty Google Maps directions, I immediately headed east on I-84, which goes up the Columbia River. 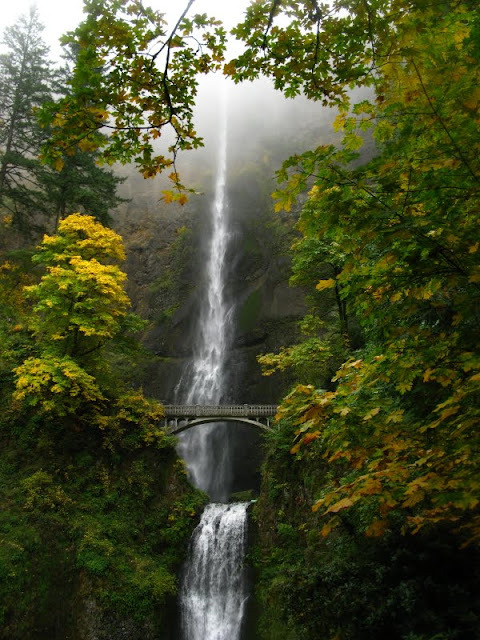 My first goal: stop at Multnomah Falls (Google Maps location), one of my favorite places. 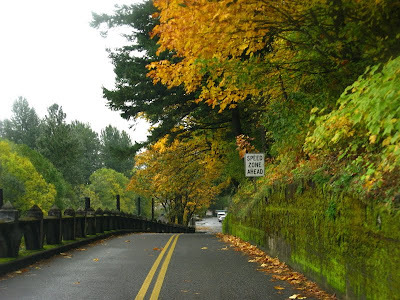 To that end, I got off the freeway and took the old road, the Historic Columbia River Highway, which goes by several falls. 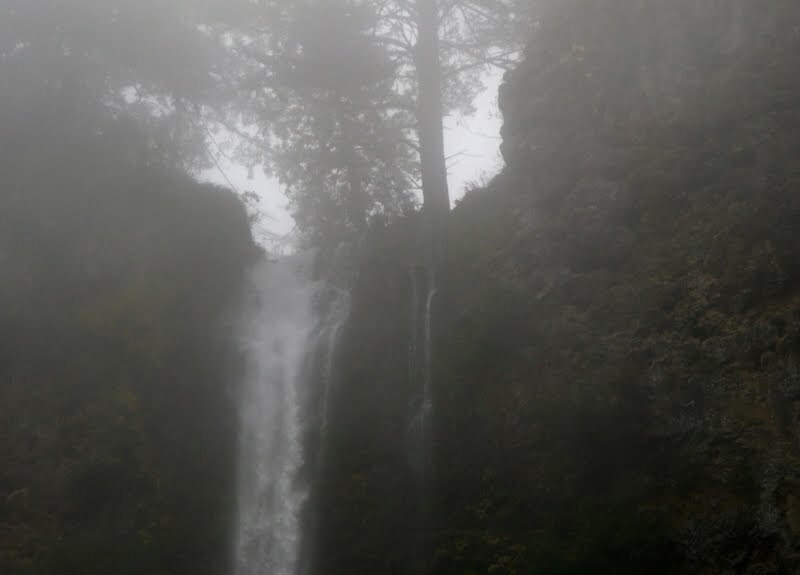 The first view of the falls, from the parking lot area, made it seem as though it was coming out of the low-hanging clouds. Would I be able to see the entire falls? 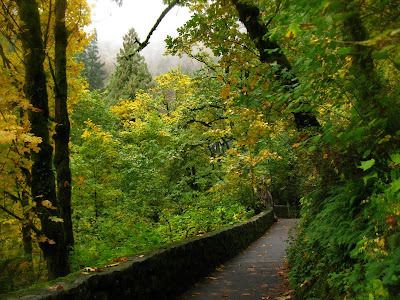 The upper and lower Multnomah Falls, and the footbridge, from a little ways in. The bridge - Benson Bridge - was built in 1914 by Simon Benson, an early emmigrant to Oregon. 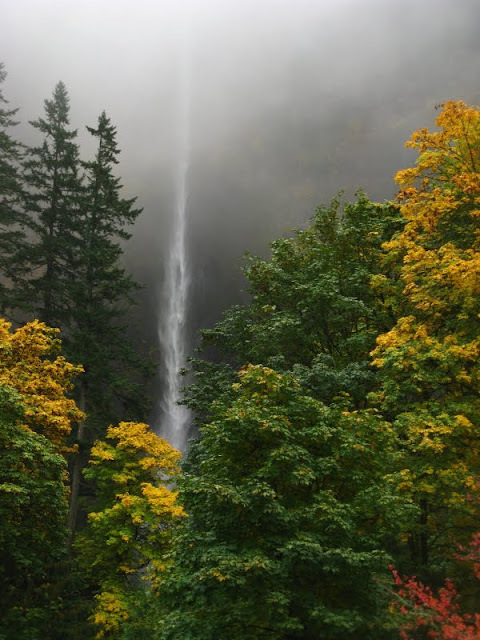 Multnomah Falls - the second highest year-round waterfall in the U.S. - flows over part of the Columbia River Basalt Group (CRBG), specifically five flows of the Grande Ronde Basalt, which is the lower part of the Yakima Subgroup of the CRBG (Mangan et al, 1986). 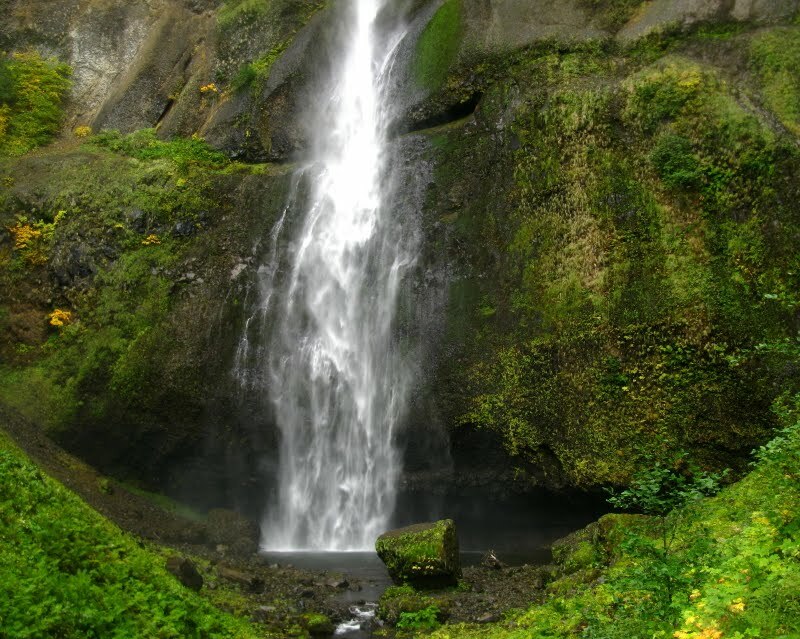 Many of the online links I found say that six flows are exposed in the cliff face of the falls; from what I can tell from an original source, six flows of the Grande Ronde Basalt are exposed from the Columbia River to the top of the falls, with pillow lavas being at or just below the very top of the upper falls (Norman and Roloff. 2004). 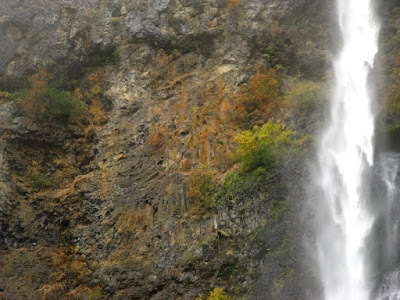 Norman and Roloff's strat section makes it look like there are five flows in the cliff faces of the uppper and lower Multnomah Falls. Anyway, check out their drawing and see what you think! 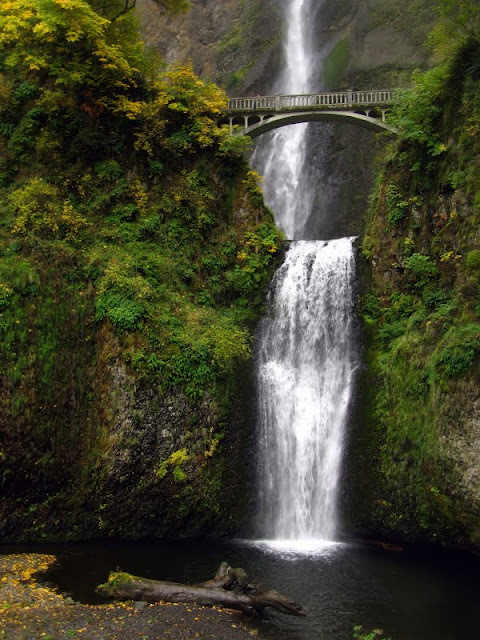 These are the lower falls, with Benson Bridge above and the upper falls above and behind the bridge. 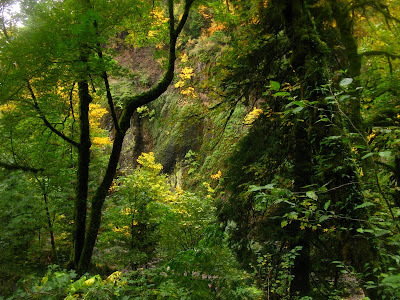 It's a moderately easy hike on this trail, through wonderful rainforest - see the ferns! - to the bridge. 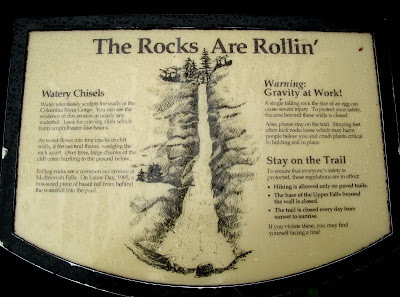 At the bridge, this sign tells part of the story of a huge rock that came off the face behind the upper falls in 1995. The rest of the story is told here. The huge rock mass that fell off the cliff shattered when it hit the upper plunge pool, resulting in minor injuries to some people on the bridge. When I was there in late 2000, five years after the rockfall, the falls didn't look the way I remembered - from visits decades earlier and from photographs. Well, I'm thinking that the rock fell from the large diagonal fracture area just above the curvilinear, nearly horizontal fracture cutting across the entire lower part of the photo. I base this conclusion partly from memory, and partly from a July, 1995, photo on Wikimedia that shows a rock mass instead of a diagonally fractured area. 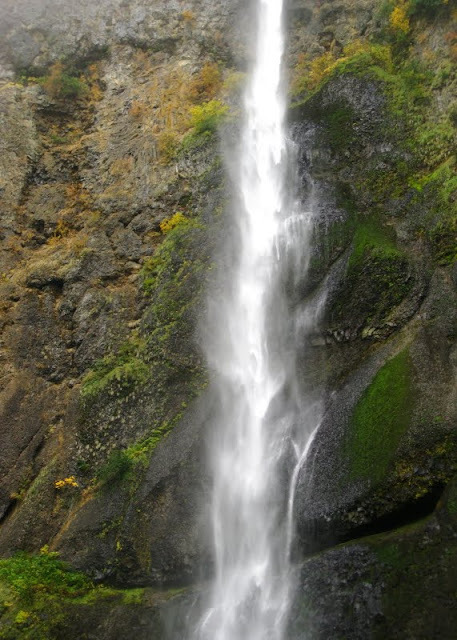 Also, compare the full resolution version of the Wikimedia photo to Ron Schott's gigapan of Multnomah Falls, from August 6, 2009. And one more thing before we look higher: the rock in the center foreground of this photo is not "the" rock that fell in 1995. For one thing, it's not large enough to be the bus-sized rock. For another thing, the mass that fell shattered into pieces upon hitting the ground. And besides that, this rock is present in old photos including the Wikimedia photo of July, 1995. This tan area near the top of the falls shows some interesting radiating to irregular columnar jointing in the basalt, just below some of the pillow lavas, which can be seen in the upper part of this photo (enlarge to see the pillows). 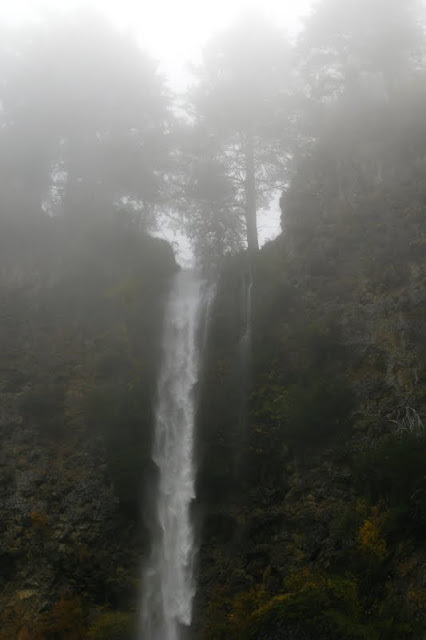 And finally, here is a close-up view of the uppermost part of the upper falls, which was almost hidden in the low-hanging clouds. I've walked the trail to the top - once, I think - back in 1993. I highly recommend the trail just for the immersion into the rain forest. And there's a great view looking straight down the falls. Ooh, neat water near the bottom of the upper falls! Another shot of the wonderful rainforest, this time on the way back toward the parking lot. 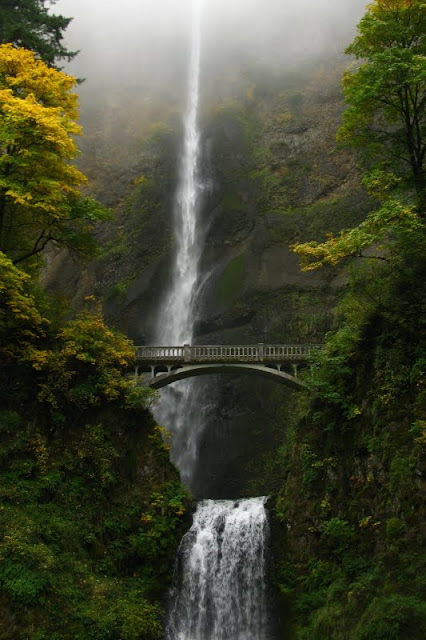 Anyone who visits Multnomah Falls should consider eating in the historic Multnomah Falls Lodge, which was built in 1925. This time, I just stopped at an outdoor coffee and snack stand and got a hot chai tea to go. Norman, D.K., and Roloff, J.M., 2004, A Self-Guided Tour of the Geology of the Columbia River Gorge—Portland Airport to Skamania Lodge, Stevenson, Washington: Washington Division of Geology and Earth Resources, Open File Report 2004-7. UPDATE 4Jun2010: For a view of the basaltic rock types at Multnomah Falls see this post at Geology Blues. Poetic. It's not that I'm feeling poetic, but that word came to mind, so I wrote it down. I've had the jimmy legs while trying to sleep, so I've opened the window a crack and am drinking a cold dPf while writing in my journal. I'm using a headlamp with a red LED - this has the odd effect of giving the shadow of my moving pen a deep turquoise line on the left side (toward the light) and a deep red line on the right side (away from the light and more or less behind my hand). These colors, and their arrangement around the edges of my pen and hand, remind me first of Becke lines, which surround mineral grains immersed in oils or epoxy media. Then - especially when I turn the pages of this spiral journal - they remind me of 3-D glasses, as if I've somehow entered some supra-dimensional movie. I haven't, though, I'm just writing and wondering where the one-day-late snow is, and whether I have the window cracked too far open for comfort. And that reminds me - didn't some country just recently outlaw incandescent bulbs? (Actually, several have.) If only the other bulbs worked consistently. I try to buy the most expensive ones in hopes that they will turn out to be the best ones. Hopefully there is enough "byproduct"mercury from the gold mines of the world so we won't have to go back to mining mercury at mercury mines - such as the ones in Spain and Slovenia (Almadén, Idrija) and the ones in the Coast Ranges of California (New Almadén, New Idria). Seeing liquid mercury drip from old trench and pit exposures is something I'd rather not see every day. 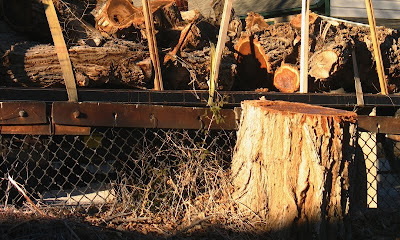 And, likewise, running across old-looking but still-in-use jars of mercury used for gold extraction by old-timers - whether in some out-of-the-way prospect north of Napa Valley or down some dusty dirt road in the Mojave Desert - is not something I like to come upon unawares or unexpectedly. The old-timers in question (some of them are still around, perhaps?) are always quite casual about showing you their gold-rich mercury, and they are equally casual about showing you their dusty, disorganized assay labs out in the middle of nowhere. Jars, bottles, and tools of all sorts are scattered on old wooden work benches built against walls - these are their lab tables. From one etched, north-facing window, you have a nice view of the creosote desert and rocky granitic mountains. Want to have lunch in here? (I think not.) And is that an ice chest I see over near the doorway to the main cabin? Yes, the garage-shed assay-lab is attached to the living area of this old field shack. Too many rusted and broken parts, too much dust, and too many old and unknown lab chemicals are lying around loose. Where did you say you're getting the gold from? 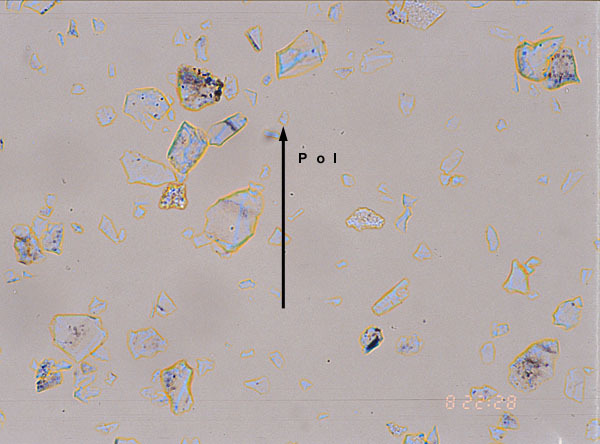 Those pinkish brown, fractured granites over there, the ones with the narrow seams of goethitic iron-oxides in either brown carbonate or microcrystalline silica? Veins, you call them? I think I'd be being generous if I called them veinlets. Okay, we'll high-grade just those tiny veinlets, and then we'll see. We'll get back to you after our commercial lab does its thing. (No, you can't do the assays for us. We're already thinking that you got the gold the same place you bought the mercury - maybe in some old Mother Lode mining town?) Maybe we'll be back, and maybe we won't - but no, we won't be looking at your lab anymore, no matter how proud you are of it. And who was I with, down there in the east-central Mojave? Seems it was in the same area where a small gold mine was operating - the mine that routinely over-loaded their blast holes such that the metal roof of their mine office had dents and holes from large rocks that fell out of the sky every day, rocks blasted out of their small open pit. We ate lunch near the buses, that field trip day, then drove an entire mile away to avoid the coming bombardment. I don't know what year it was. The location suggests to me that I was there with either PB or NJ - although the sampling part could have been a joint effort with BS and an assistant of his - except I don't think we worked that area with double partners. So the answer may be forever lost in the dirt and dust of that messy lab or in the steep and rocky slopes two canyons over. Could I find that mine shack again? Maybe. I have a geographic location tucked firmly away in my head - it's a little SSW of that small gold mine, down some wide southerly-heading dirt road, generally SE of that broad, alluvial-choked peak, and in some vague area between or amongst two north-south-trending ranges. Besides which, unless it was on a tiny piece of private land, it's probably gone. These photos are my attempts at digitizing 35mm slides taken in 1998, by way of holding the slides up to the sky and shooting them with my 10MP digital Cannon. 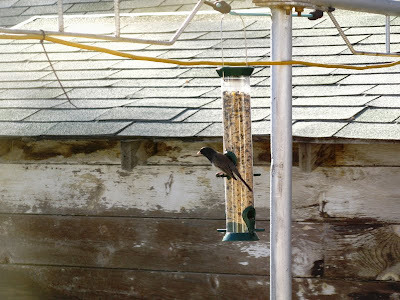 Results: contrasty, strange color balance, a little bit of bluriness, but better than nothing until I get a slide scanner (or take the slides out for a pro job). Ah, but the blues are great! Can't tell what the original film was, probably an Ektachrome of some kind. 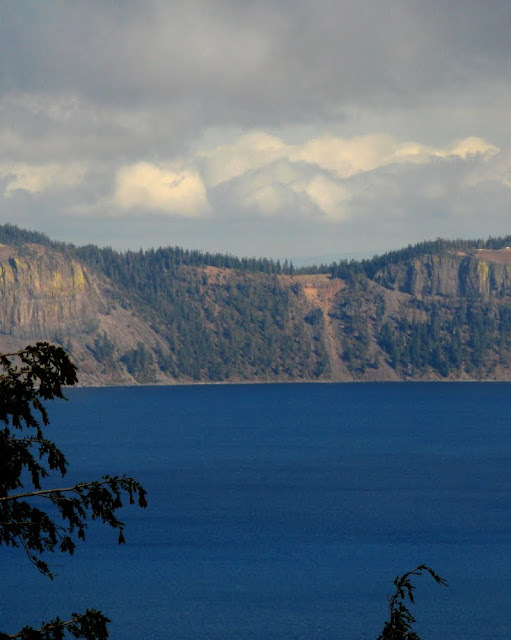 Photo from the base of the fault looking northwest across Upper Klamath Lake. The rubbly material in the foreground is rock in the footwall of the fault, basalitic cinders and bombs, possibly brecciated. The fault! The brownish rocks seemingly piled against the fault on the left side of the photo are what I interpreted to be older colluvium in the hangingwall of the fault. The fault plane with a short-handled sledge for scale. 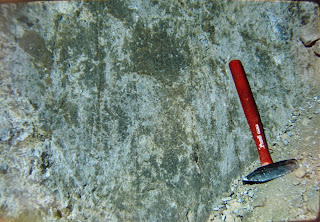 Fault slickensides and striations are approximately parallel to the hammer handle. 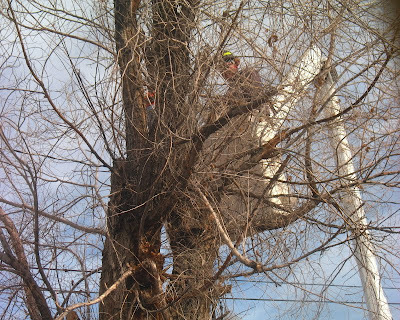 (It was very steep up there, and hard to get everything to align perfectly.) A bit of footwall breccia can be seen in the lower left. This photo will not enlarge. 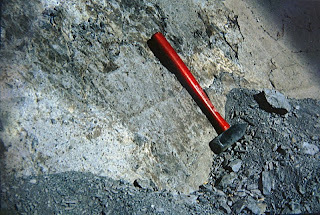 Another photo of grooves on the fault plane, with the same hammer for scale. The hammer handle is roughly parallel to the fault grooves and slickenlines. This photo will also not enlarge. Another view of the fault plane, this time looking toward the southeast. The fault plane is steeper than this photo suggests; I didn't try rotating it (the photo, not the fault). 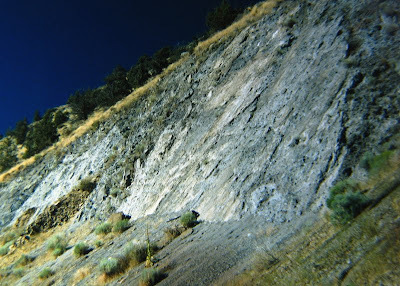 There were two ages (at least) of colluvium on the slope: the older, poorly sorted, crudely layered, bouldery debris appeared to be in the hangingwall of the fault; the finer-grained, layered material beneath a rabbit brush in the right part of the photo mimicked the current slope and appeared unaffected by the fault. I encourage you to walk up and look at this for yourself - the views and the fault are both spectacular. 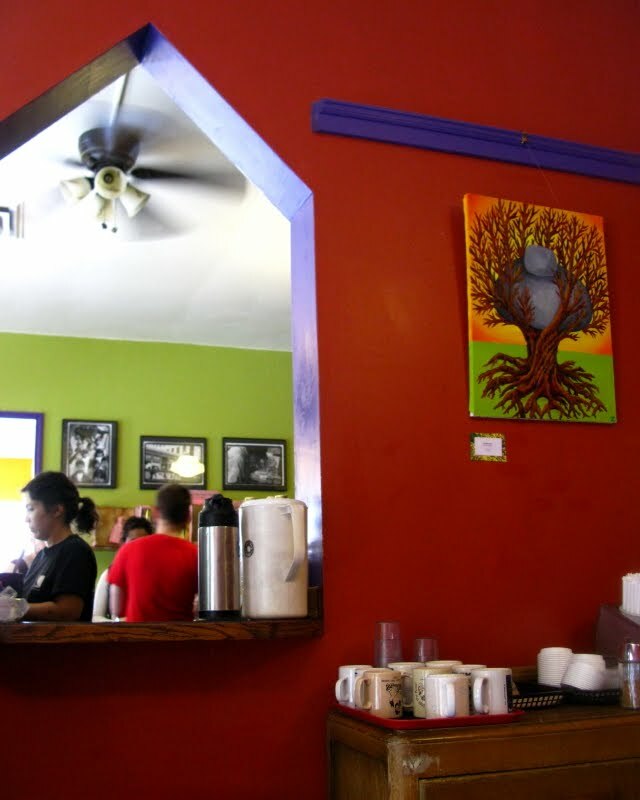 On the fourth day of my journey to the GSA meeting, I made my way to Portland from Eugene via some non-interstate roads that took me through Corvalis, home of The Interzone, Lockwood's favorite coffee shop. I went inside and met that coffee shop denizen, the geological, political, satirical blogger at Outside the Interzone. It's a colorful place, bustling with activity. Students and others come and go, and people hang around writing, studying, blogging, and what have you. Bicycles are everywhere outside, which is a good thing, because if you don't happen to have a university parking sticker, you are unlikely to find a nearby parking space that lasts longer than an hour (or was it two?). I didn't want to feed the meter, because the meter maid was out in full force, looking for people with California plates anyone overstaying their welcome. I parked in three different parking places, the last one being several blocks away. 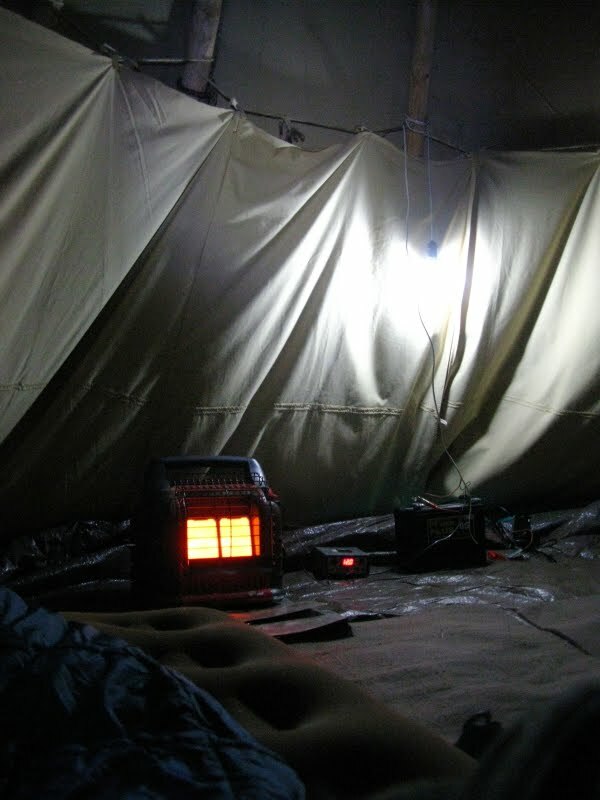 But don't let that stop you from dropping in: the coffee is good, the company is excellent! Lockwood was a great host. 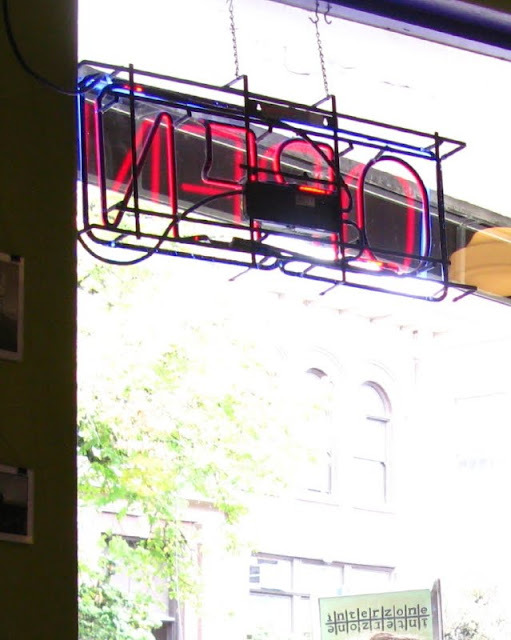 He immediately bought me an Americano with room for cream, then we both sat at his table with our respective laptops plugged in and open, looked at routes to Portland on Google Maps, chatted, got over-coffeed (I did, anyway), read some blogs, and chatted. As I was leaving, Lockwood gave me a specimen of natrolite in calcite, which I was duly instructed to give to Callan Bentley of NOVA Geoblog when I got to the geoblogger meetup in Portland Monday night (photo here). Mission accomplished! 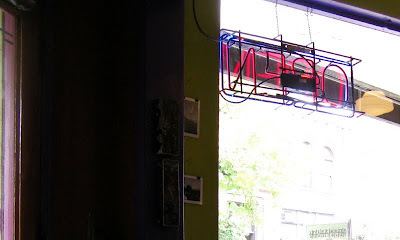 Yes, I really was there, on the inside, looking outside at the Interzone sign. Moving on with my road trip up to last month's GSA meeting in Portland, my next stop past Annie Creek was Crater Lake itself. The east and south parts of the rim road were closed, but the exit out the north was open (currently all but the entrance from the south to the Rim Visitor Center are closed). I haven't been on the north exit/entrance to the park for a long time, and the sidetrip off Highway 97 added only a few extra miles (although also a couple extra hours!). 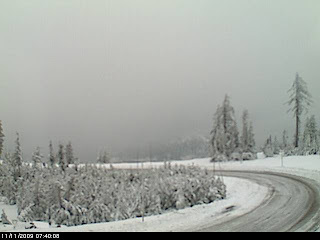 The gray photo is from the Crater Lake webcam earlier this morning - normally you can see across the lake from this location. The first five photos were taken from three stops here, which are all very close together on the West Rim Drive. 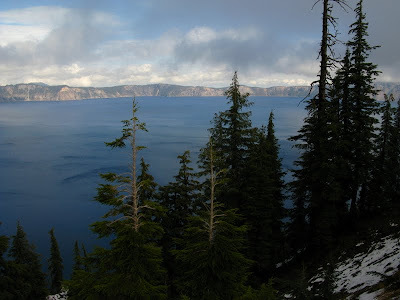 This is a fairly standard photo of Crater Lake, with Wizard Island in the west part of the lake, and Llao Rock on the crater rim beyond. 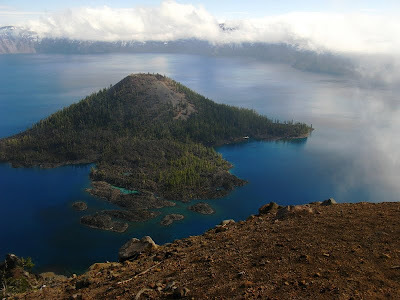 Wizard Island, an andesitic cinder cone, formed about 7,200 years ago (Bacon, 2008 and Cranson, 2001/2002). 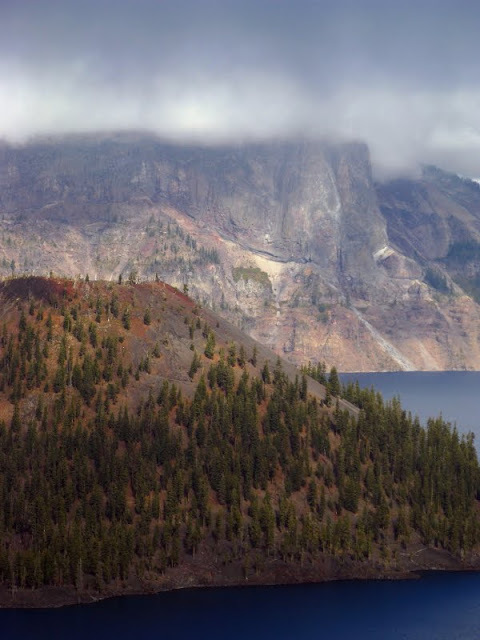 Llao Rock, the massive cliff on the crater rim behind Wizard Island, is a rhyodacitic dome, with a flow beneath the clouds to the right, that erupted about 200 years before the climactic eruption of Mt. Mazama. The whitish layer beneath Llao rock is an air-fall ash and pumice layer from an eruption just prior to formation of Llao Rock. 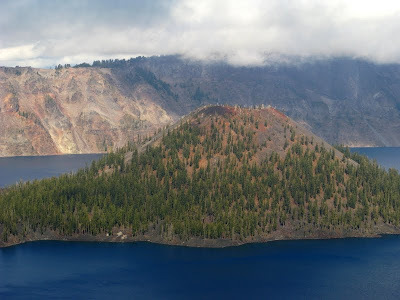 That explosive eruption about 200 years prior to the climactic eruption produced a widespread ash bed found in northern Washington, southeastern Oregon, and western Nevada, where it was called the Tsoyawata Bed by J. O. Davis before it had been correlated back to its source at Crater Lake (Davis, 1977; Davis, 1978; Bacon, 1983; Davis, 1985). 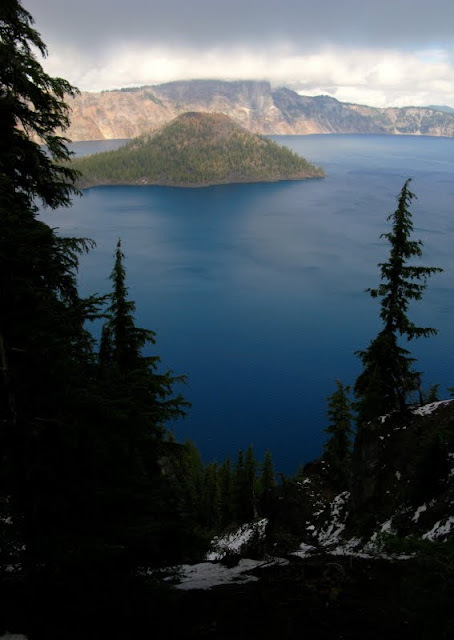 As usual, the water of Crater Lake was exceptionally blue. 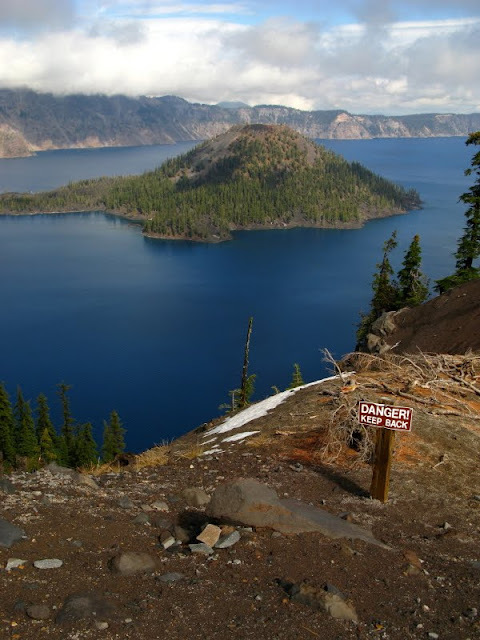 If you make it to Crater Lake when most of the roads are open, be sure to take the boat tour out to Wizard Island (the hike down - and then back up - the crater rim to the Cleetwood Cove boat dock is steep and rocky). 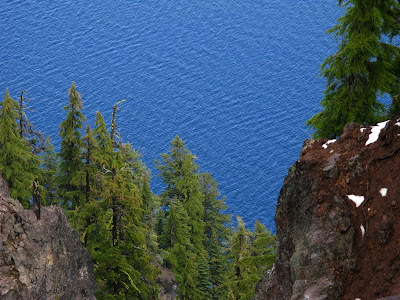 After landing at Wizard Island, you can climb the cone to the top, where the trees are fascinating, and where you can also see the cinder cone crater. Then you can get a later boat back to the Cleetwood Trail. 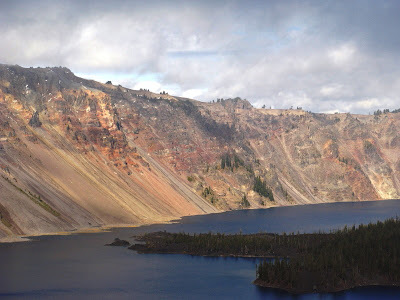 This photo looks across the lake at the west side of Wizard Island, where an andesitic flow reaches toward the west crater wall. The Devil's Backbone can be seen across the flow on the rim beyond, just right of the low mass of trees. 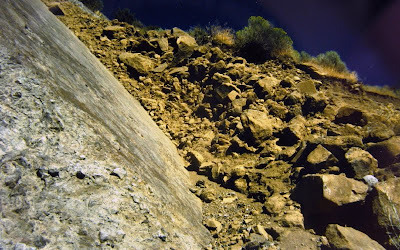 This is an andesite dike - the andesite of Devil's Backbone - going up the crater wall (enlarge photo - the upper part of the dike appears to be in shadow). The dike cut through the older rocks about 4,000 to 5,000 years ago (Bacon, 2008). 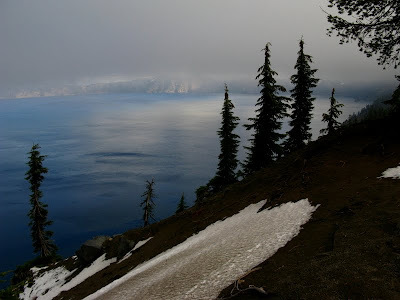 At stop three (centered here on Google Maps), I looked across the lake toward Cloudcap, which is mostly in the clouds, and I noticed something a ways to the left of it, on the crater wall. That something can barely be see in this photo, between the trees on the far side of the lake. Here it is, enlarged a bit, a light-colored line on the opposite crater wall. It's the Wineglass, after which the Wineglass Tuff was named! Enlarge the photo, and you'll see that the Wineglass is a wineglass-shaped talus slope beneath a layer of Wineglass Tuff (aka Wineglass Welded Tuff of Williams, 1942). Just to the left of the Wineglass is a prominent cliff called The Pallisades, formed by the andesite of Roundtop, which has a K-Ar age of 159±13 ka (Bacon, 2008). 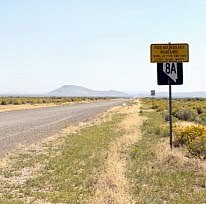 Instead of obeying the sign, I followed my geological instincts to this cliff edge, where I found some great glacial striations and grooves on some lava rock (possibly the andesite of Applegate Peak, which has a K-Ar date of 258±8 ka to the south - Bacon, 2008). The grooves point approximately toward the Wineglass - a northeasterly direction. 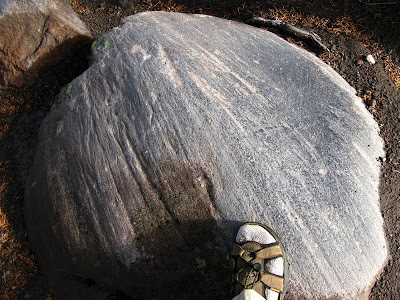 Here's an enlargement of the grooves and striations, with a field sandal for scale. It looks to me like the ice was moving to the southwest (lower right in the photo), but I didn't examine the outcrop in detail while there. The nature of the day was apparent at the Watchman Overlook, where many were standing around waiting for the mist to clear. 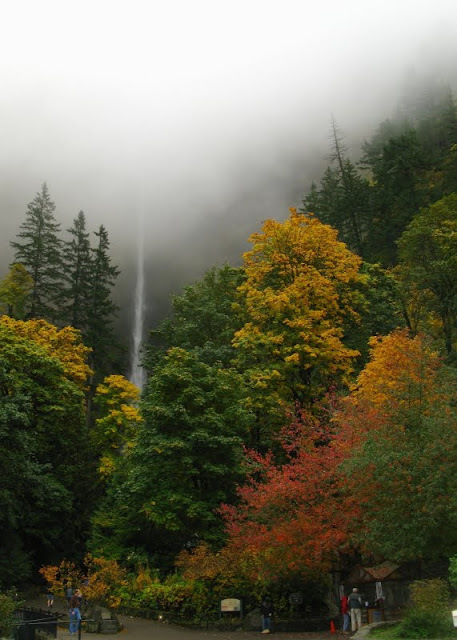 The mist came and went, ebbing and flowing, finally clearing for a clear view of Wizard Island. 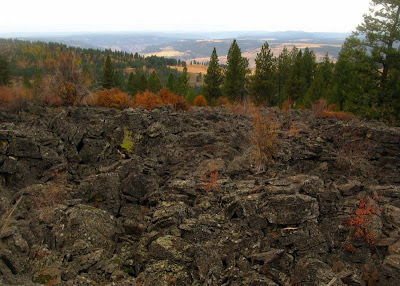 You can see the crater of the cinder cone in this photo, along with an andesitic flow that erupted from vents near the base of the cone. The flow comes almost to the edge of the lake at the Watchman Overlook. While watching the mist come and go, I took a few photos toward Llao Rock, and just happened to get a bit of the Devil's Backbone in the picture, just beyond the dark foreground mass, in the mist near the water's edge. Here you can see the lower part of the Devil's Backbone dike, beyond that darkly shadowed mass of rock in the foreground. 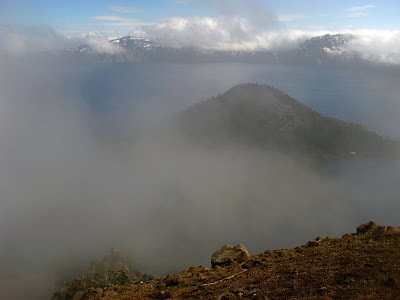 Beyond that, you can see Llao Rock and the white ash layer below it from a different angle, through the mist. The dark rock in the foreground is part of the andesite of the west wall, which has a K-Ar age of 70±4 ka (Bacon, 2008). This is the andesitic flow on the west side of Wizard Island, with some deep blue to turquoise water in the shallows around the little islands and in the coves and bays in between them. 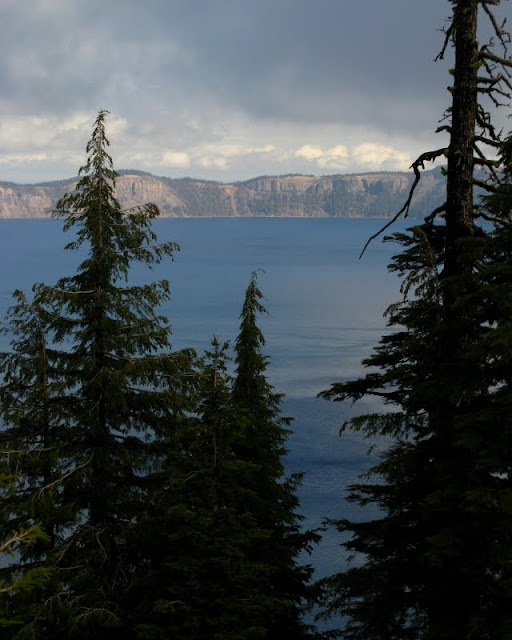 In case you're wondering what Crater Lake looks like beneath all the water, click here for a great underwater view as seen from The Watchman. 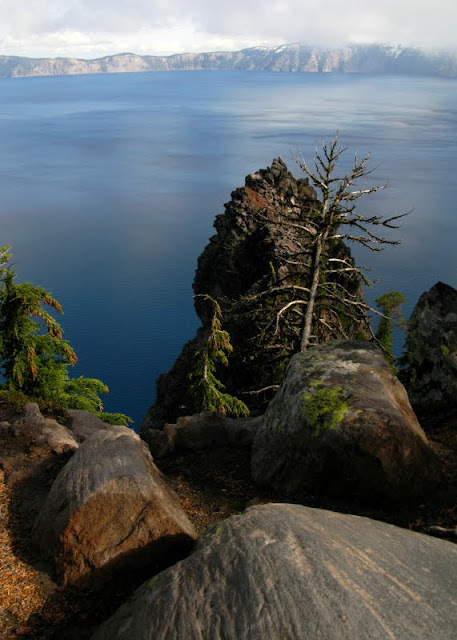 You'll see that there is another cinder cone in Crater Lake, one completely under water. I didn't climb the trail to The Watchman Lookout Station; it looked a little inhospitable to me. 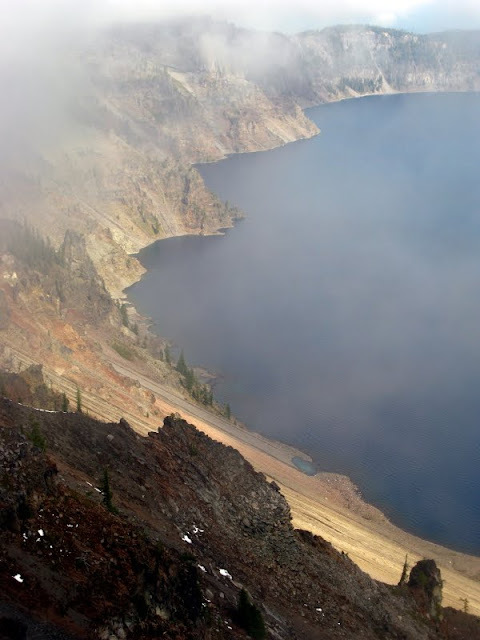 Bacon, 1983, Eruptive History of Mount Mazama and Crater Lake Caldera, Cascade Range, U.S.A.: Journal of Volcanology and Geothermal Research, v.18, p.57-115 [many exerpts can be found on the CVO website]. Bacon, C.R., 2008, Geologic Map of Mount Mazama and Crater Lake Caldera, Oregon, Including the Database for the Geologic Map of Mount Mazama and Crater Lake Caldera, Oregon by David W. Ramsey, Dillon R. Dutton, and Charles R. Bacon: U.S. Geol. Survey Map SIM-2832. 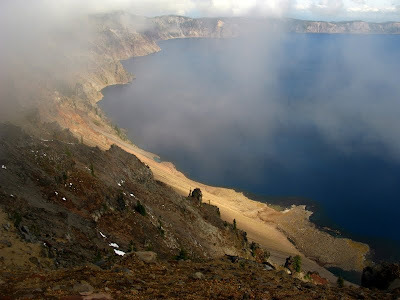 Cranson, K.R., 2001/2002, Cinder Cones in Crater Lake National Park: Nature Notes From Crater Lake v. 32-33. 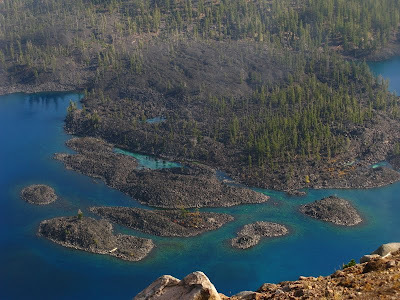 Davis, J.O., 1985, Correlation of late Quaternary tephra layers in a long Pluvial sequence near Summer Lake, Oregon: Quaternary Research, v. 23, p. 38–53. Williams, Howel, 1942, The geology of Crater Lake National Park, Oregon: Carnegie Institution of Washington Publication 540, 162 p.